Where did all the time go? The good thing about events is that they happen. They happen on a particular day, even at a particular time. That gives you a focus. All of your energy has to be metered out to get things done by then. We had two events we wanted to create something for this month. 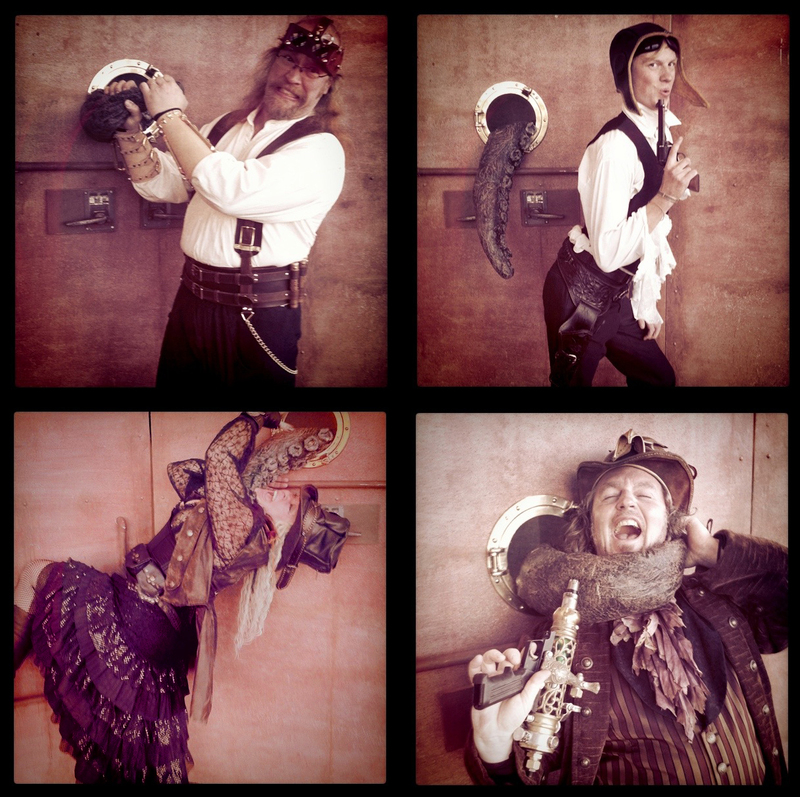 The first one was SteamCon in Bellevue. That one was just for fun. Fun to get dressed up and see how other folks bring their own creativity and passion to concept of SteamPunk. Last year we showed up with a couple hats we made and adjusted our costumes appropriately. This year we made a bigger effort. We upcycled a couple old leather jackets from Good Cheer and got out all those bits and bobs I have been collecting to create some fantasy weapons and custom fitted holsters. It was really fun and I learned a ton. On the day of the event we drove the sidecar down to Bellevue and along with Nymbol we shot a bunch of video. The highlight of which was waiting in line for the high society teaparty with Nymbol. I will try and edit that into something digestible soon. There were some truly spectacular costumes and artisans there. I did the math and ordered the materials. Even with extra shipping they would not arrive until exactly one week before the show. This was going to be tight so I called Rosie and told her. Fast forward to the day the materials arrived. After a day of toiling and pattern making it is 12am and I am now by myself in the studio. 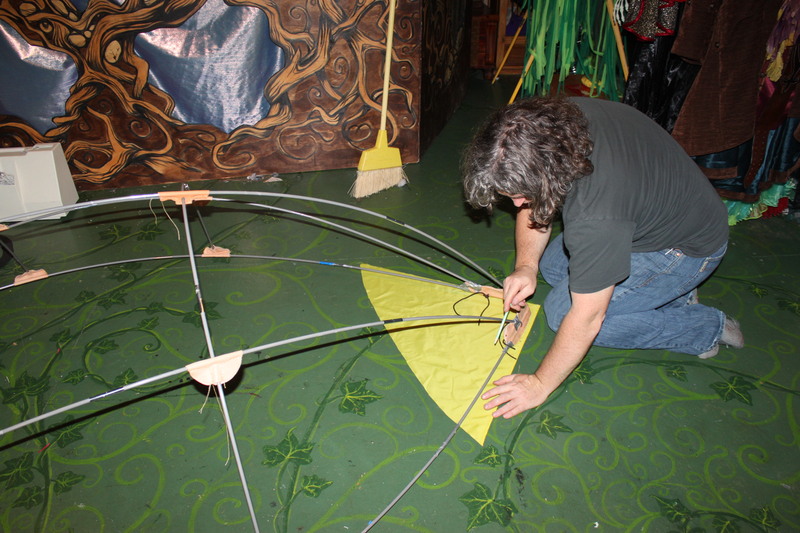 I am putting the finished touches and stitches on my last connection points for the nylon poles and it is looking good. All of the sudden someone or something bitchslaps me in the temple. Hard. I look around and no one is there. I am seeing stars and rubbing the side of my head. When I can focus again see that one of the nylon poles has come out of the frame. It was this moment that Smaug truly earned the nickname Sam would give him the next day during a similar experience. I can’t write it here but you can only guess. Thus began a three-hour plus fight with the poles. I tried a myriad of things but in the end I used that old standby. Duct-tape. From there on everything rolled pretty smoothly but “muthermaƒµ©√¶∆∂” Smaug still had some surprises yet in store. Time was now ticking like a frieght train and it wasn’t until dress rehearsal that Smaug made his maiden voyage over to the theatre. There were still some things to finish but at least he could take the stage. You know when you tell someone you gained 30 lbs and they go ” Don’t worry, You look great!” Even though they have seen you in photos and video. Then you show up in person and their eyes say “holy crap you are fat!” (o.k. I digress. That describes my own life right now.) Well,….That is pretty much what happened when we showed up with Smaug. 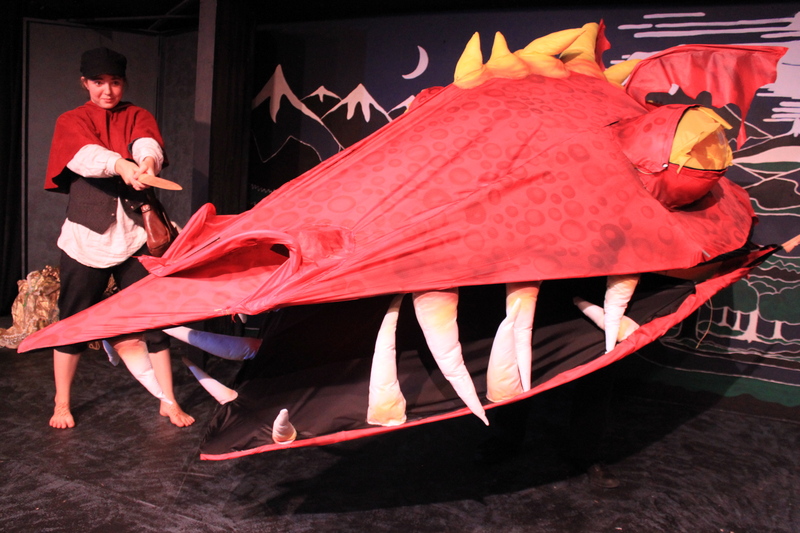 After some Frenetic, Dress Rehearsal adjustments were made only a day later Smaug rolled through the side curtain to Ohhhhs and Ahhhhs from the Audience. During Sunday’s performance, when he was stuck down at the end of the scene a concerned little Cindy Lu Hu voice from the audience was heard “Why did the dragon die?? ?” It melted my heart. We had pulled it off. That is what I have always loved about creating. Puppets in particular. When the finished puppet transcends it’s materials and becomes a living, breathing creature it is very rewarding. It goes without saying that the Production is amazing, and not because there are now three of our children in it. Tabatha charms as Bilbo, Izzy adds her zest into her Elve and Goblin characters and Smaug scares up a good performance as himself. 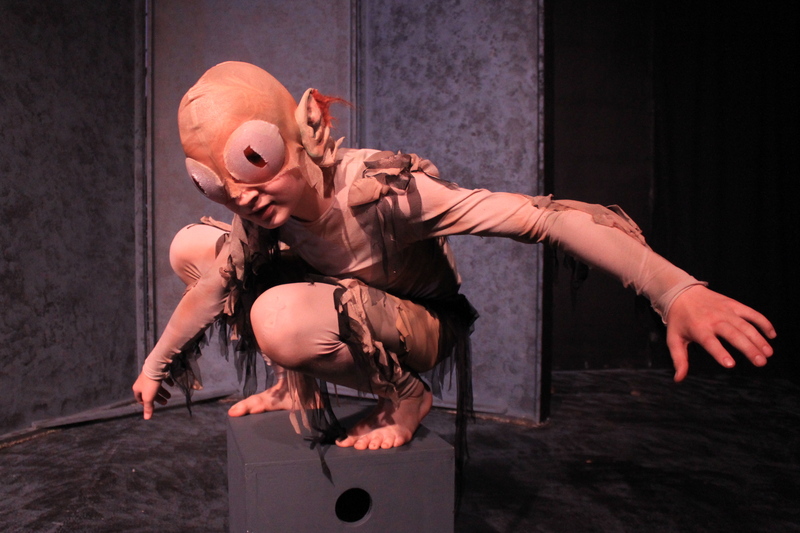 Our adopted Nephew Caelen Coe also absolutely rocks his acting debut as Gollum. All those years of Dance and movement make for a truly eerie version of everyone’s favorite bug-eyed lunatic. Please go see it if you can. Thanks for sharing all your adventures and creative projects. You all rock Steampunk. I’m inspired.